To protect/maintain water quality in the State of California, developers and facility operators meeting certain criteria are required to implement site-specific stormwater management plans. In accordance with State agency requirements, ENPLAN prepares construction Storm Water Pollution Prevention Plans (SWPPPs), industrial Storm Water Pollution Prevention Plans, and Water Pollution Control Programs (WPCP) addressing construction and industrial activities. Additionally, we assist municipalities with the preparation/ implementation of guidance documents as required by the State. Further, we supervise the implementation of our plans, conduct site inspections, perform required sampling, and prepare final documentation. Overviews of the basic types of stormwater management plans are provided below. For more information, email or call us at (530) 221-0440. 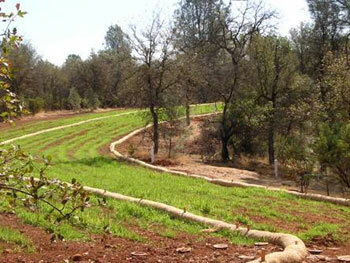 With a few exceptions, proponents of construction projects disturbing one or more acres of soil must apply for coverage under the State’s Construction General Permit. One of the big requirements of the Permit is that the applicant must develop and implement a Construction SWPPP. Construction SWPPPs generally focus on measures to prevent sediment-laden stormwater from discharging off-site during construction activities. The State recognizes two construction types requiring SWPPPs: Traditional Projects (e.g., grading and land development, street construction, vertical construction, etc.) and Linear Underground/Overhead Projects (LUPs) (e.g., conduits, pipelines, towers, poles, trenching/excavation, etc.). More information regarding Traditional Projects and LUPs and their differing monitoring requirements can be found in the Construction General Permit, dated June 2012. The Construction General Permit prescribes quantitative methodologies to estimate the amount of sediment that can discharge from a construction site, to classify project risk levels, and to establish the required level of monitoring activities. Monitoring is conducted to ensure that measures described in the SWPPP function to maintain water quality downstream. See our Construction Industry Advisory Page for details. The State requires specific certifications for managing the SWPPP process. Qualified SWPPP Developers (QSDs) are authorized to prepare, certify, amend, and implement/monitor SWPPPs. Qualified SWPPP Practitioners are authorized to implement/monitor SWPPPs. Industrial SWPPPs are required for a broad range of Federal, State, municipally owned, and private facilities, including, but not limited to, manufacturing facilities; oil and gas mining facilities; hazardous waste treatment, storage, and disposal facilities; landfills; and transportation facilities (e.g., vehicle maintenance shops, equipment cleaning operations, etc.). An industrial SWPPP has two major objectives: (1) to identify the sources of pollution that affect the quality of industrial stormwater discharges and authorized non-storm water discharges, and (2) to describe and ensure the implementation of Best Management Practices (BMPs) to reduce or prevent pollutants in these discharges. A new Industrial General Permit is undergoing agency and public review. The new Permit is expected to be adopted by the SWRCB in 2014. The Permit will include additional parameters regulating stormwater runoff from industrial sites. A draft of the new Permit can be viewed on the State Water Resources Control Board website. Caltrans projects with total soil disturbance less than one acre may be subject to Caltrans’ Water Pollution Control Program (WPCP). The Program serves to protect water quality (similar to a SWPPP), but with less stringent monitoring and reporting requirements. Private projects with a Caltrans nexus (e.g., those that affect Caltrans’ right-of-way, receive Caltrans funding, etc.) may also be subject to the Water Pollution Control Program. Project proponents subject to the WPCP are required to designate a Qualified SWPPP Practitioner (QSP) or Qualified SWPPP Developer (QSD) as their Water Pollution Control Manager (WPCM). 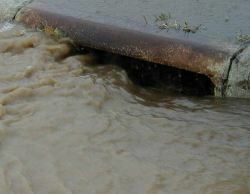 The Municipal Separate Storm Sewer System (MS4) Phase II Permit Program regulates stormwater discharges from various groups, including, but not limited to, small municipalities, educational campuses, military bases, prisons, and hospital complexes. Affected entities are required to prepare guidance documents to help protect and maintain water quality within their Permit area. The purpose of the guidance document is to describe stormwater best management practices and address aspects such as public education and outreach, discharge detection and elimination, construction and post-construction conditions, pollution prevention, and good housekeeping. As of July 1, 2013, in accordance with the recently amended MS4 Phase II Permit Program, new and existing Permittees were required to upload a guidance document to the State’s Water SMARTS system. The guidance document provides the Permittee with a map to compliance (to occur over several years) and allows for greater transparency with the public. ENPLAN is available to assist municipalities as needed to comply with the MS4 Phase II Permit Program. ENPLAN specialists utilize cutting-edge geospatial information technology to determine areas of disturbance, identify watershed boundaries, map storm-drain infrastructure, and generate quality maps. Measures recommended for stormwater management are tailored to the site and activity. Our stormwater plans not only to stand up to intense regulatory scrutiny, but they have also been praised by our clients for embodying control measures that are both cost effective and practical to implement.